The Canadian Studies Program and the Dept. of English are hosting the visit of two award-winning Canadian writers later this week. Stephen Brunt is Canada’s preeminent sports journalist and the author of several bestselling books, including the critically acclaimed Searching for Bobby Orr (2006). Randall Maggs is the author of Night Work: the Sawchuk Poems (2008), one of the most talked-about books of Canadian poetry in recent memory. While I will be the first to tell you that hockey is only a small part of Canada and Canadian literature, these writers are some of the finest to have ever written about the sport. Their visit will be a great treat for our students, whether they are interested in hockey or not. This event will be of special interest to students taking writing courses in poetry and non-fiction or in Canadian Studies. On Friday, both writers will read from their work, discuss the significance of three of its most important figures (Orr, Gretzky, and Sawchuk), and offer their thoughts on the place of hockey in Canadian and American culture. Their Friday visit will be followed by a reading at the Burlington Book Festival on Saturday at 4 PM. Books by Brunt and Maggs will be available for sale at each event. Open to all members of the public. 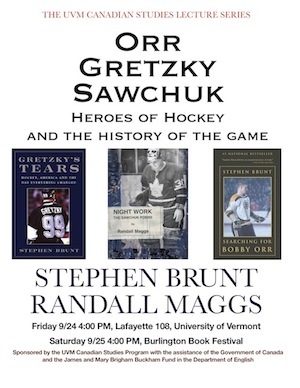 Maggs and Brunt will be signing books after each event. Sponsored by the University of Vermont Canadian Studies Program and Department of English, with funding from the Government of Canada and the James and Mary Brigham Buckham Fund. Stephen Brunt, a columnist at the Globe and Mail, is Canada’s premier sportswriter and commentator. About his most recent book, Gretzky’s Tears: Hockey, Canada, and the Day Everything Changed, the Montreal Gazette wrote “Long the consensus pick as Canada’s best sportswriter, Brunt has probably earned the right to be called one of our best writers, period.” His previous book, the #1 national bestselling Searching for Bobby Orr, was called “not only one of the best hockey books ever, but a book that transcends hockey” by the Edmonton Journal. Brunt is also the author of Facing Ali: The Opposition Weighs In; The Way it Looks from Here: Contemporary Canadian Writing on Sports; Mean Business: The Rise and Fall of Shawn O’Sullivan; Second to None: The Roberto Alomar Story and Diamond Dreams: 20 Years of Blue Jays Baseball. He lives in Hamilton, Ontario, and in Winterhouse Brook, Newfoundland. Randall Maggs is the author of two collections, Timely Departures (1994) and Night Work: The Sawchuk Poems (2008) and co-editor of two anthologies pairing Newfoundland and Canadian poems with those of Ireland. Night Work won the Kobzar Literary Award, 2008 Winterset Award, the 2009 E.J. Pratt Poetry Award and was a Globe and Mail top 100 book of 2008. Maggs is artistic director of Newfoundland’s March Hare festival of music and literature and has just retired from teaching literature at Sir Wilfred Grenfell College, Memorial University, Corner Brook, Newfoundland. Night Work: The Sawchuk Poems is a hockey saga, wrapping the game’s story in the “intense, moody, contradictory” character of Terry Sawchuk, one of its greatest goalies. In compact, conversational poems that build into a narrative long poem, Night Work: The Sawchuk Poems follows the tragic trajectory of the life and work of Terry Sawchuk, dark driven genius of a goalie who survived twenty tough seasons in an era of inadequate upper-body equipment and no player representation. The book is illustrated with photographs mirroring the text, depicting key moments in the career of Terry Sawchuk, his exploits and his agony.